Taylor Forklift. For more product information, Click to view the website. 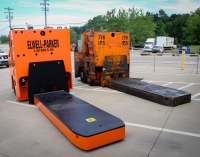 Elwell Parker Platform Truck. For more product information, Click to view the website. Ottawa Yard Truck. For more product information, Click to view the website. Pettibone Cary-Lift. For more product information, Click to view the website. Rail King RailCar. For more product information, Click to view the website. Your enquiry has been sent to H&K Equipment, Inc..